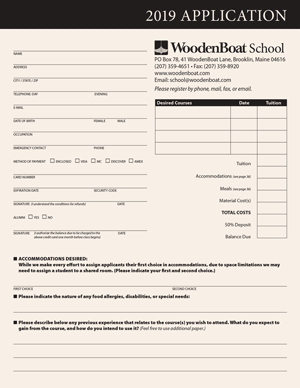 Staying at the WoodenBoat accommodations is recommended by us and by former students. Evening socializing and boating become, in effect, an extension of the courses, and add immeasurably to the School experience. We have a number of rooms in both the Farmhouse (next to the Shop) and in the Student House on Naskeag Road. The rooms are doubles, not fancy, but clean and airy. Bathrooms are shared by several rooms, and students bring their own sheets, soap, and towels. We also have a number of local cottages that we use on a regular basis. Family members are welcome as space permits, but pets are not. Guests may take room and board with us depending on space availability. 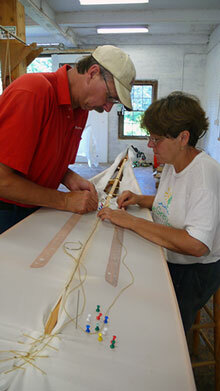 We also have campsites available on the WoodenBoat property. Again, these are quite basic, with no electrical outlets, but in a pleasant location. Campers have their own toilets and shower facilities. Pets are not allowed in the campground. Our kitchen and dining hall are located in the Student House (originally the Mountain Ash Inn). The cuisine is American with some gourmet treats. Ingredients are fresh, portions are hearty, and service is buffet style. For students taking a single week course, room and board extends from Sunday dinner through the following Saturday’s breakfast. For students in longer courses, room and board runs from the Sunday on which the course commences until the Saturday morning following the last day of the course. Weekend meals are light and continental. Maine can be on the chilly side during late spring and early fall. We recommend that you pack warm clothing and throw an extra blanket or sleeping bag in the car. Bring a bike if you have one—it’s a great way to get around Brooklin. Note: If you reserve a room with us and decide to cancel this reservation, you must notify us two weeks prior to the start of the course to receive a full refund. Lodging/Meal prices include tax where applicable.